At today's Chicago Board of Education meeting I spoke about testing and the costs of the school closings. The following are my prepared remarks. Good afternoon. My name is Sharon Schmidt. I am a CPS parent and teacher and a reporter for Substancenews.net. A. N. Pritzker elementary student Leo Sharkey and O. 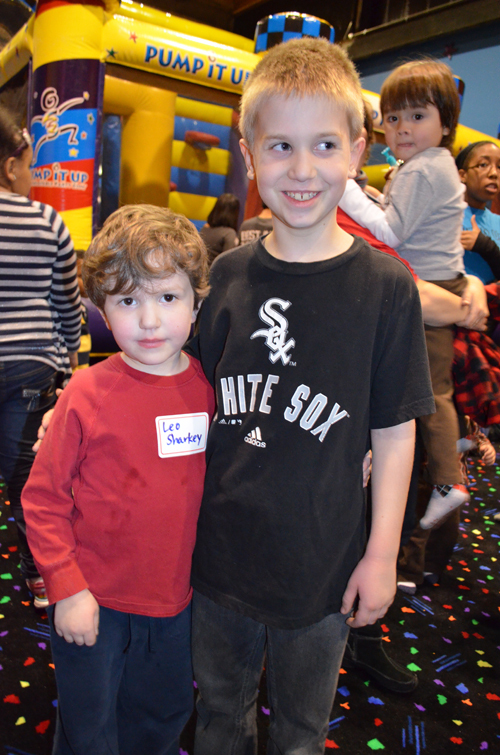 A. Thorp elementary student Josh Schmidt (pictured at the CTU family social night on January 26 at Pump It Up) are not burdened with excessive standardized tests because their parents opt them out. All parents in Chicago have this choice.I usually come here with questions about your testing program. The most helpful exchange I had came many years ago when I asked how to opt out my sons from unnecessary testing. Thanks to the answer I received my sons have opted out of tests in their 2nd, 3rd, 4th, 5th, and 6th grade classrooms. They have skipped NWEA MAP tests, REACH performance tasks, Scantron Performance Series, CPS Benchmark tests, DIBELS, mClass math, and even the ISAT, which is used for promotion in 3rd, 6th, and 8th, but not in the other grades. In addition to the testing issue, I want to add my voice to the outcry against school closings. I urge the Board members to visit the schools you plan to close. If you cannot make it to these places where your decision will affect so many people, you should vote no next month against the closing. Think critically about the financial concerns of school closings and the cost to communities. Closing schools in D.C. didn’t save money, it cost money. Likewise, closing schools in Chicago won’t save money and it will certainly bring many other costs to the communities affected.